The United States of America stands for the universal notion that every individual possesses the inalienable right to liberty and to determine one’s own path to happiness free from undue governmental control. Patrick Henry preferred death to living without it. In fact, “liberty” is so central to the idea of American democracy that the founders of our nation created a Bill of Rights to protect personal liberty from the tyranny of government. All people, they argued, should be free to express unpopular opinions, choose one’s own religion or take up arms to protect one’s home and family without fear of reprisal from the state. The Bill of Rights’ Sixth Amendment prohibits federal, state and local governments from taking the liberty of a person of limited financial means unless a competent attorney is provided to the indigent accused at all critical stages of a criminal or delinquency procedure. This is true, even if the potential term of incarceration is no more than a single day. John Adams risked his reputation for these American ideals by defending in court the British soldiers involved in the Boston Massacre, recounting years later that a defense lawyer ought to be the last thing an accused person should be without in a free country. Mr. Adams’ words remain true today. Without the aid of an effective lawyer, almost any individual stands the risk of the government putting him in jail when charged with a crime. The majority of us would not know, for example, what is and is not admissible in a court of law let alone how to procedurally convince twelve jurors that the government has failed to prove their charge beyond a reasonable doubt. If this is true of even the most affluent and educated among us, is it then fair to let someone who has fallen on hard times, or has been let down by our country’s educational system, or is not yet an adult face a loss of liberty at the hands of government, simply because they lack the guiding hand of counsel to navigate the complexities of our legal system? Despite the necessity of competent counsel to fair and equal justice, state and local governments regularly fail their Sixth Amendment duties. Though indigent people accused of felonies have attorneys appointed to their cases more regularly than not, those public attorneys are far too often appointed so late in the court process, or are so financially conflicted, or experience such undue judicial interference, or do not have the legal training/experience to match the complexities of charges filed, or juggle far too many case at any one given time (and usually all of the above) that defendants have, in effect, no legal counsel advocating on their behalf. But the problems of our nation’s misdemeanor courts are starker. Many misdemeanor courts across the country simply fail to provide any lawyers at all, despite the constitutional imperative to do so. Before serious debate can take place on how to abolish the denial of counsel in America’s misdemeanor courts, it is necessary to undertake a diagnostic as to why this problem persists. Though many people may think of tyranny as an abrupt overthrow of a democracy by a despot, the truth is that governmental tyranny occurs in democracies at a slow creep. It is accomplished through a myriad of seemingly inconsequential decisions made over many decades by numerous, and likely well-intentioned, policymakers. For example, no one consciously set out to create our bloated state criminal codes in totality. And yet, now that they exist, a seemingly endless demand on taxpayer resources are dedicated year in and year out to the pursuit of justifying the existence of those criminal codes. Court structures therefore are adjusted to accommodate earlier and quicker case resolutions, under the guise of efficiency and cost-effectiveness, but only serve to create the ability to bring more and more charges against an ever-expanding set of defendants. Think of how the creation of new lanes on a highway often fails to solve traffic congestion because the expansion simply results in a greater number of commuters using the roadway, and one begins to get the picture. When the demand for more and more resources outpaces the ability of a jurisdiction to support the continued expansion of the criminal justice system, the system itself turns to extracting as much money out of poor defendants as possible. When 6AC staff are in the field, court actors often report to us that they need to charge the indigent accused fines and fees to pay for the structures to collect fines and fees. When liberty is no longer an inalienable right, but rather the leverage criminal justice systems exert to justify and pay for their own existence, government tyranny is achieved. Our criminal justice systems have evolved without the necessary checks and balances that competent defense lawyers bring to guard against such tyranny. Therefore, the solution to America’s criminal justice problems is simply to provide the indigent accused with a competent attorney the moment the court process begins, with the time, training and resources to zealously advocate on his behalf, just as the Constitution requires. The problem is that we have asked states to police themselves in this regard. 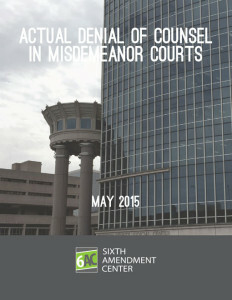 There is currently no federal entity tasked with ensuring that the dictates of Sixth Amendment case law are upheld. If the past 50 years have proved anything, it is that states are not likely going to end the denial of counsel on their own. Therefore, the federal government should authorize the U.S. Department of Justice to investigate and litigate Sixth Amendment violations.